Library Special Collections holds the records of Prime Minister John Curtin, and also the records of several other West Australian politicians, including Premiers (Carmen Lawrence and Geoff Gallop) federal ministers (Paul Hasluck, Kim E. Beazley and John Dawkins) and West Australian ministers. Many of these collections include press cutting albums and scrapbooks collated by ministerial staff. 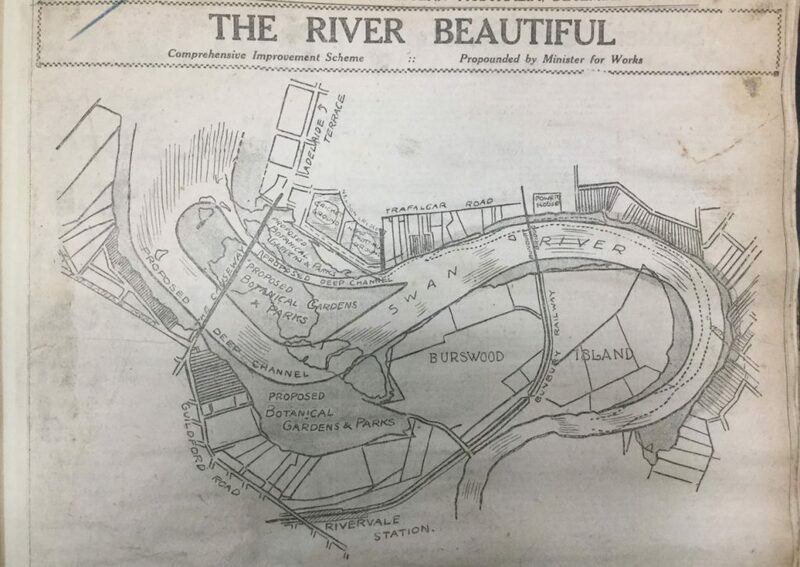 Object #44 is the oldest of these albums, created in 1924 for the newly appointed Minister for Public Works, Labour, Water Supply and State Trading Concerns, Alex McCallum MLA. The Minister’s full title was a bit too long to fit neatly on the cover. Album #1 in the McCallum collection, JCPML00835/1 starts shortly before the announcement of the newly elected Collier Government ministry on 17/4/1924. The album features a leather strap and buckle closure reminiscent of McCallum’s early working life. He was first indentured as a harness maker in South Australia before commencing an apprenticeship in bookbinding. In 1898 he moved to Western Australia where he progressed to the position of Manager of the Government Printing Office, a position he held until 1911. Along with the news cuttings the album contains some unexpected gems, including full page cartoons, verse, official opening programs and a number of menus. Western Mail, Nov 18, 1926. 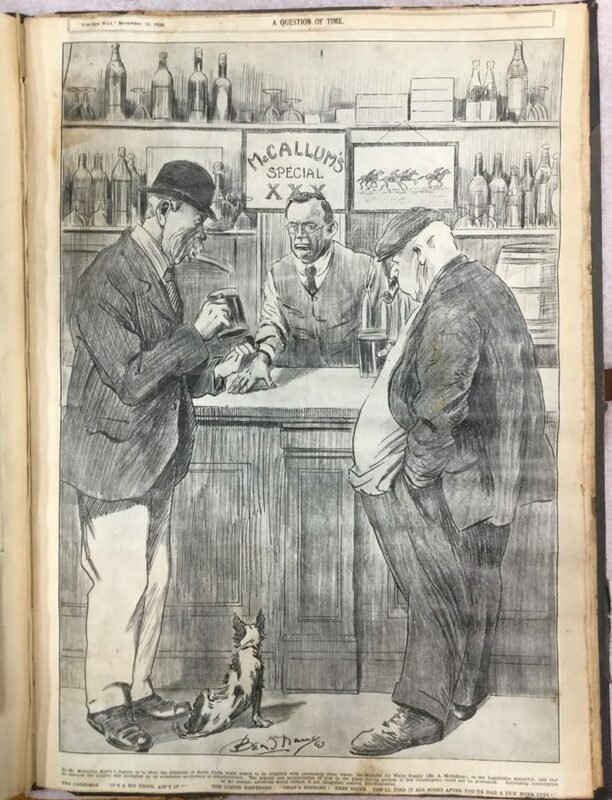 This cartoon is one of several in the album drawn by Ben Strange who drew cartoons for the Western Mail from 1901 until his death in 1930. Many like this one about water quality in North Perth, were printed on the full page. One of McCallum’s achievements as Minister was the enacting of the Swan River Improvement Act, 1925. The scheme was disrupted with a change of government, and the onset of the Depression, but eventually much of what was envisaged by McCallum was achieved. McCallum Park is named in recognition of him. 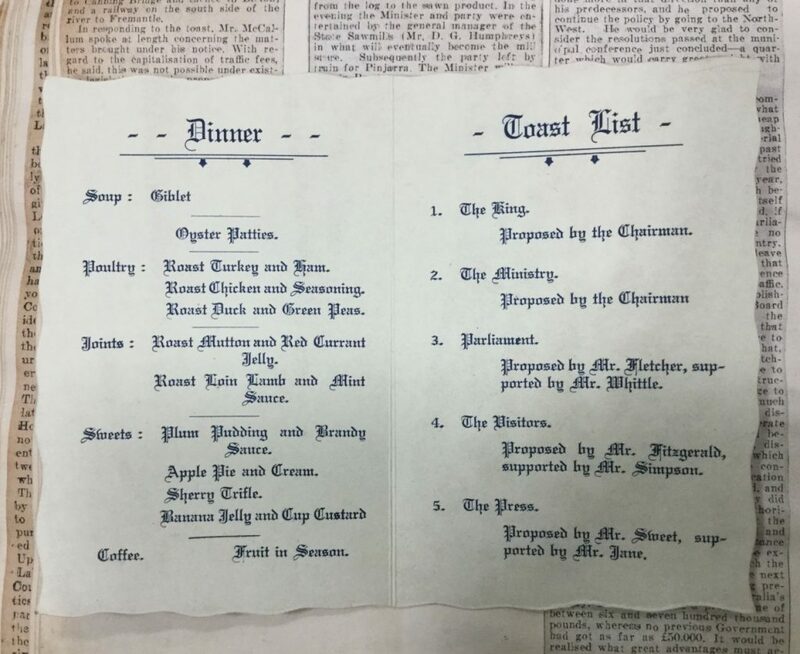 Menu and Toasts for Luncheon at the Hotel Majestic, Melville Road Board. As Minister, McCallum worked long hours and travelled extensively throughout Western Australia. This program and menu is typical of the luncheons and dinners he attended. Mostly by road and sometimes by rail, much of the travel was arduous, including his North West trip of 1926 travelling more than 8000km by boat, road and rail. For more about the North West and Kimberly trip see the Historypin tour at Alexander McCallum Northwest and Kimberley 1926. 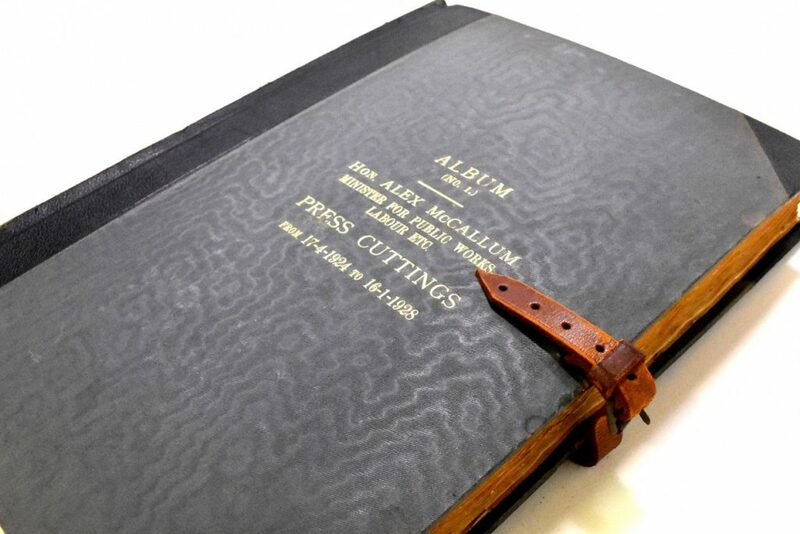 Album No.1 covers nearly four hard working years for McCallum, and the final pages show how the demands of office combined with long days were taking a toll on McCallum’s health. 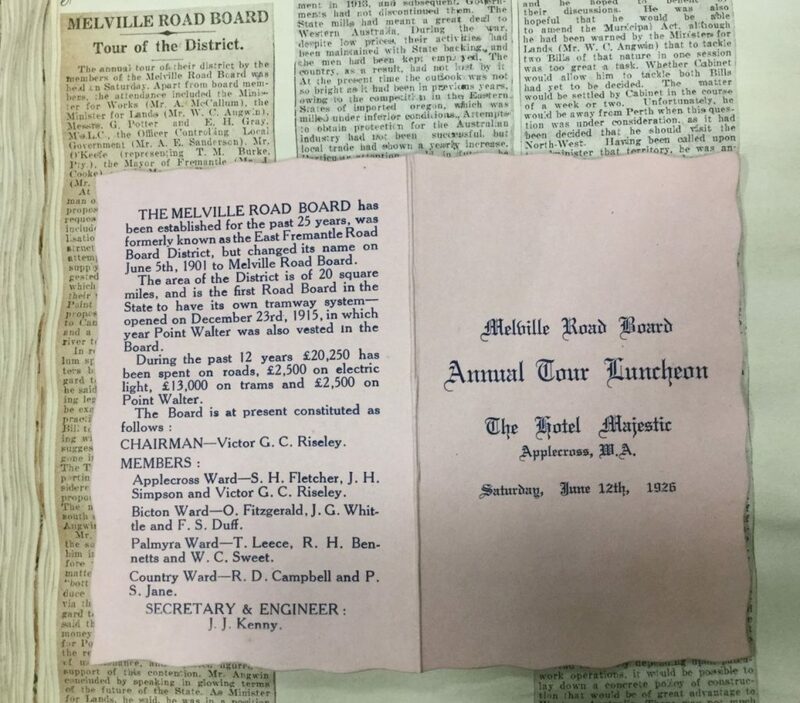 Pasted onto one of the last pages is a small cutting from the West Australian, 7th Jan 1928, with the heading ‘Minister for Works: Health Trip to England’ alongside articles describing many farewell events held in his honour. The ‘Health trip’ would become a six month world tour, and McCallum would return to Western Australia in August inspired to resume his hard work for the good of the State, with the story continued in Album No. 2, JCPML00835/2. Previous Previous post: 43. Royal Invitation, State Banquet, 1920. Next Next post: 45. John Curtin’s Call up Notice – W.S Form 8 Order to Attend Military Training, 1916.